Method scouting results are important data for determining analysis conditions, so obtaining highly reliable data is essential. Method Scouting Solution provides the data required for analysis via a graphical user interface, as well as automated controls conforming to laboratory operations configured in the system settings, thereby providing data reliably. Mobile phase purge conditions and equilibration when automatically switching mobile phases and columns are key issues in method scouting. 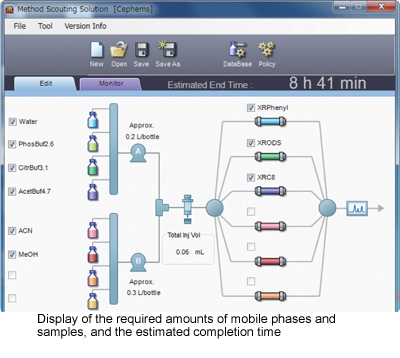 With Method Scouting Solution, scouting reflects laboratory operations, thanks to automatic control of mobile phase purging and equilibration based on preset system configurations. useful for reviews if problems with data occur. The columns and mobile phases used for method scouting are controlled in a database. During analysis, they are easily selected via a graphical user interface. The names of the selected columns and mobile phases can be reflected in analysis reports. This consolidates notation for the names of the columns and mobile phases used in the laboratory, preventing mistakes with respect to important column and mobile phase conditions when reviewing scouting results. Method scouting uses a variety of mobile phase and column combinations. Method Scouting Solution calculates the required amounts of these mobile phases and samples in advance, and provides this data to avoid shortages. Furthermore, upper pressure limits are automatically controlled based on column pressure resistance data registered in the column database, thereby avoiding degradation of precious columns. In addition, the system provides estimates of completion time, with consideration to the time required between analyses for processes such as mobile phase auto-purging and column equilibration. As a result, scouting can be configured to suit your work schedule. The ability to quickly search the large quantity of data obtained from method scouting for suitable conditions is important. 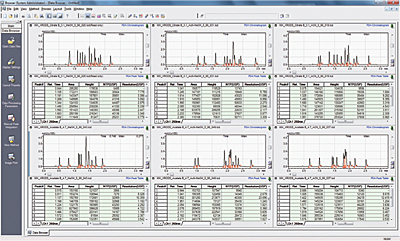 The data browser function provided with LabSolutions meets this need by displaying a list of these chromatograms and analysis results. In addition to retention time, area, and height, analysis results include the degree of separation, separation coefficients, theoretical plate numbers, symmetry coefficients and other indices for chromatogram evaluation, supporting the process of checking the large amount of data for optimal conditions. CLASS-Agent Report enables quantitation in order to search the data obtained from method scouting for optimal data. With CLASS-Agent Report, numerical data and graphs can be created, utilizing Microsoft Excel, from calculations based on the degree of separation and the number of peaks. As a result, in addition to visual comparison of chromatograms, determinations can be made based on quantitation of determination standards.